China, with more than 1.2 billion people, is the most populous country in the world. Overall population density of the country is somewhat over 110 people per square kilometer, which is only about one-third that of Japan and less than many other countries in Asia and in Europe. Regional variations, however, are dramatic as over 90 percent of the Chinese population live on less than 40 percent of the land. 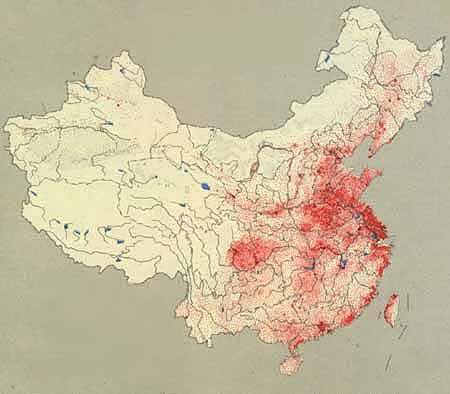 To the left is a map showing the distribution and density of China's population. 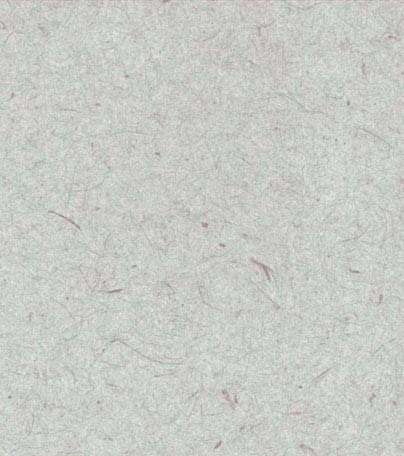 One tiny dot indicates 50,000 people. How does the distribution of China's population relate to its topography and climate? 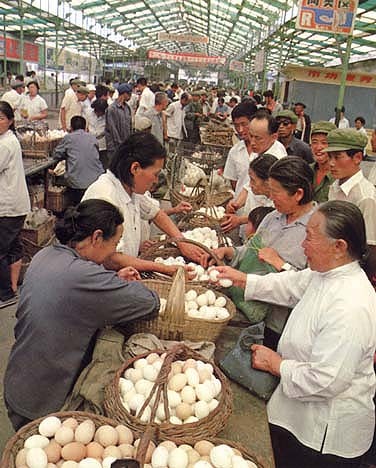 Immediately after the 1949 revolution the Chinese government encouraged its people to have large families in order to increase the work force depleted by years of war. However, production and modernization could not keep up with the growing population, thereby forcing a change in government policy. An extensive birth control program has been in effect since the late 1970s. 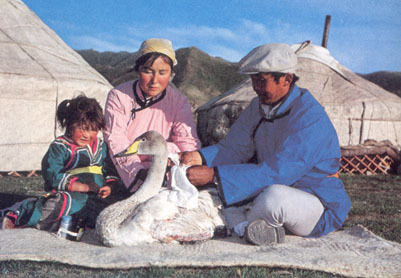 Nowadays, city-dwellers are required to adhere to the one-child policy, and even in the countryside families rarely have more than two or three children. 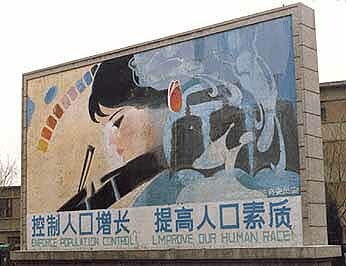 This population control propaganda poster reads "Control population growth, improve our human race." What are the liabilities of a huge population for China? China, like all other large states, is multi-ethnic. 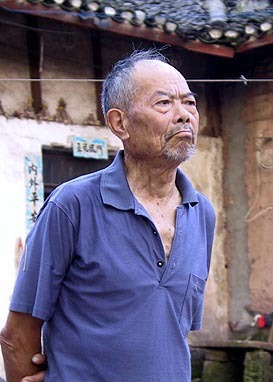 The Han people, however, form the large majority, with about 94 percent of the population. While former Chinese governments traditionally acknowledged the Han, Manchu, Mongol, Turkish, and Tibetan ethnic groups, the current Chinese government officially recognizes 56 ethnic groups, including the Han. The Han majority speak Chinese, but most of the minorities speak other languages, falling into 15 main language families. Below is a map showing the distribution of China's population in terms of the major language families. Note that what is generally termed Chinese is here divided into Mandarin and Southern. Which region has the greatest variety of minorities? 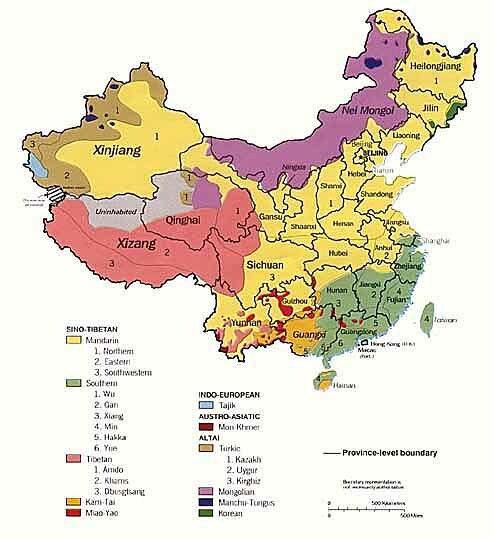 Han Chinese are also marked by further linguistic diversity, in that the spoken forms of their different dialects vary as widely as the languages of Europe. All of the Han nonetheless use a common written form of Chinese and share common social organization, values, and cultural characteristics that are recognized as Chinese. If these dialects are not mutually intelligible, how can they use a common written form? How do you suppose people in China would recognize that the buyers and sellers here are Han Chinese? 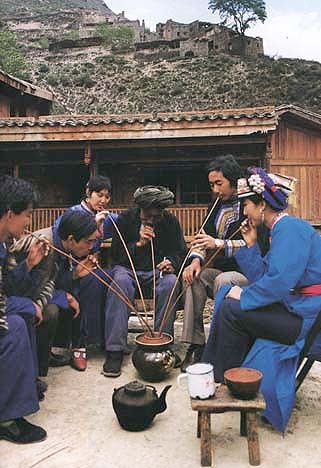 Over the centuries many ethnic groups have been absorbed into the Han majority, especially in the south and west. 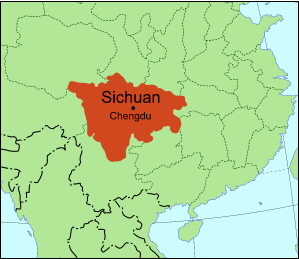 Sichuan has always had many ethnic groups, but today the large majority are Han Chinese. 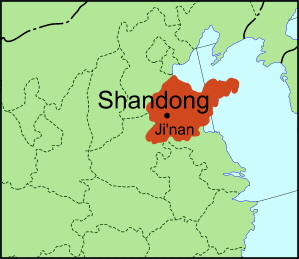 The majority of ethnic minorities today live in the northeast, northwest, and southwest, undoubtedly as a consequence of the expansion of the Han Chinese over the centuries. 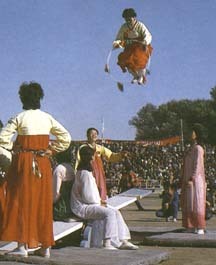 Below and to the right you see members of the Korean minority playing a traditional game. Why do you think there are so many Koreans in China? 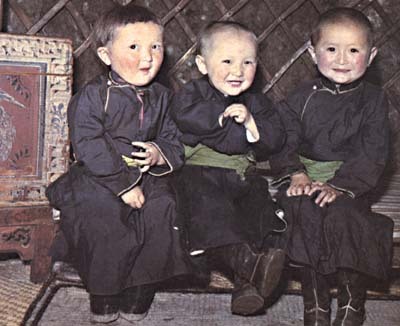 Mongols are one of the largest minorities in China, concentrated especially in the Inner Mongolian Autonomous Region. 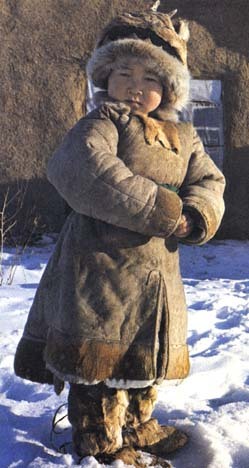 Many Mongols outside the cities still live in large round tents called yurts. 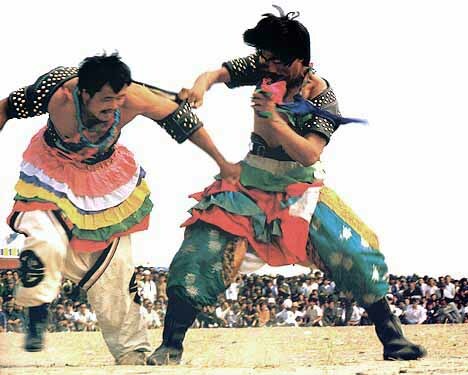 Wrestling, shown below, is a sport the Mongols love. 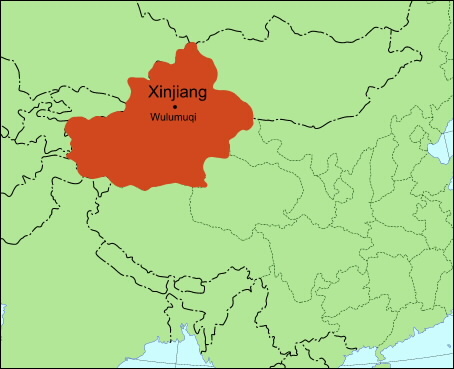 Most ethnic Uighurs live in the Xinjiang Autonomous Region. 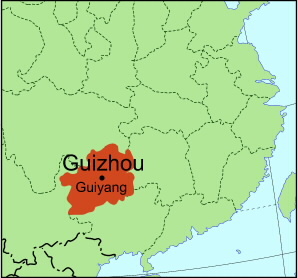 Beginning in the Han dynasty, Han Chinese fought for hegemony along the Yili and Tarim caravan routes through this region, but it was not until the Qing dynasty that the area was fully incorporated into the Chinese state. 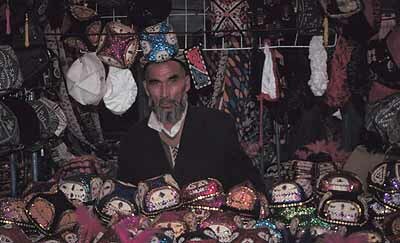 Uighurs speak a Turkish language and most are Moslem. Most Tibetans live on the Tibetan Plateau, which includes Qinghai province as well as the Tibetan Autonomous Province. To the left is a woman in traditional Tibetan clothes. Below is a scene showing a Tibetan opera performance. 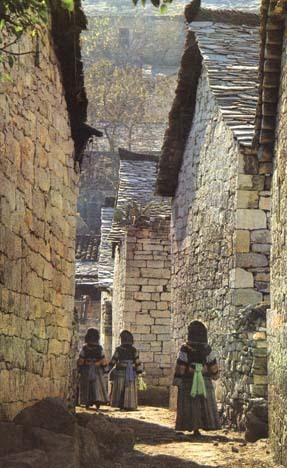 To the left is a picture showing Buyi women from Southwest China. 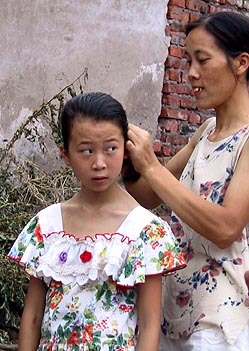 Among ethnic minorities, women's and children's clothing and hairstyle often seems to diverge more from Han customs than men's do. Can you think of any explanations for this? To the right is a picture of Qiang people in Southwest China. To the left is a picture showing a Yi woman from Southwest China. What might be the purpose of the intricate design on her jacket?